Source: http://en.wikipedia.org/wiki/File:Buelkau_orgel.jpg Click at the photo to enlarge. 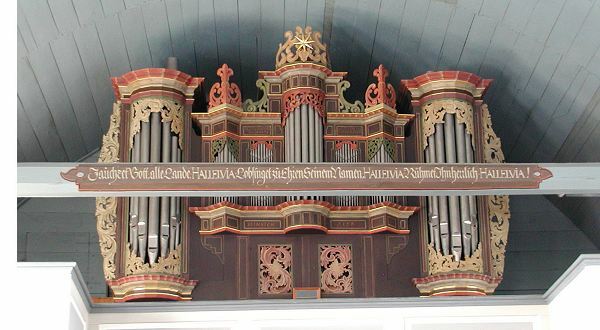 1677/79 (01): New organ by Arp Schnitger. 1686: A free pedal is added, probably by Schnitger. 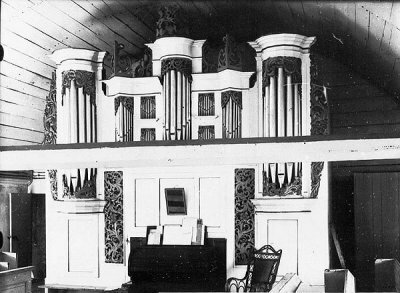 1912: Furtwängler builds a new organ in the Schnitger case, but the frontpipes are retained. 1968: Another new organ in the old case by Hillebrand. E-Mail from Ibo Ortgies from 8-6-2005:"Schreibung: Bülkau (Niederelbe) Lt. Fock 1974, S. 32-33 wurde die Orgel "bald nach 1676" und spätestens bis 1679 gebaut also wohl "zwischen 1677 und 1679" auf S. 272 schreibt Fock dann aber doch 1679 ? II P / 22 (?)" The photo was provided by Rob Kruijt. It represents the situation before the restoration of 1968.